PT Krama Yudha Tiga Berlian Motors (KTB) as an agent of brand holder (APM) Mitsubishi vehicles in Indonesia continues to improve service to its loyal consumers. Latest, KTB offers a service Fuso Big Bang to the concept of Zero Down Time. Through after-sales service, consumers can make vehicle service without disturbing the operational time of the vehicle. Truck Center's service facility for 24-hour standby support the passage of this program. "This service offers improvements made when the vehicle is not in operation. 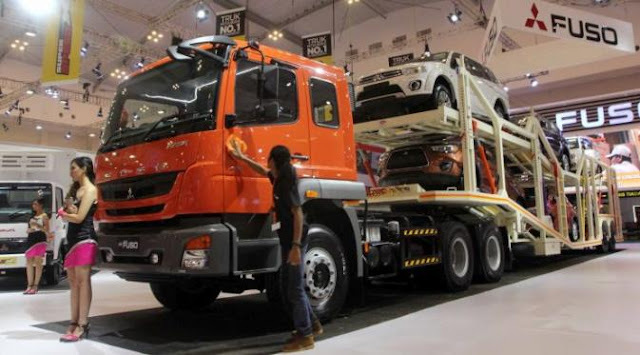 So the vehicle can be repaired, but the business can continue the way," said Deputy Group Head Service Group Mitsubishi Fuso Truck and Bus Corporation (MFTabC) PT KTB, Leonard Siahaan in arena GIIAS 2015 in Indonesia Convention Exhibition (ICE), BSD City, South Tangerang. Furthermore Leonard explained, not only services Zero Down Time, KTB also has Fuso Big Bang consisting of Mobile Workshop and Parts Depots. Through Mobile Workshop, consumers can order a spare part is needed. A service run was made with a standard authorized workshop. While Part Depo as a storage warehouse of spare parts for commercial vehicles Mitsubishi. The location was deliberately positioned in order to enable consumers to obtain spare parts.